Diamond metrology; detecting spoiled milk; smart packaging consortium. The U.S. Department of Energy’s Ames Laboratory is building a new instrument called an optical magnetometer. The system will help researchers understand the properties of new magnetic nanomaterials. The system, dubbed the NV-magnetoscope, makes use of the properties of nitrogen-vacancy (NV) centers in diamonds. According to researchers, diamonds have a flaw, or imperfection, called an NV center. The NV center serves as the sensor for the system. 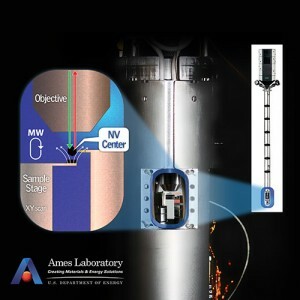 Meanwhile, Ames Laboratory’s NV-magnetoscope consists of a confocal microscope (CFM) and an atomic force microscope (AFM). With those two systems, the NV-magnetoscope can sense the weak magnetic fields of a few electrons with a spatial resolution of about 10nm. The NV-magnetoscope, in turn, will bring researchers one step closer to that reality. “When the sample of interest is brought close enough to an NV center, the sample’s magnetic field is extended to the location of the NV center and affects the center’s quantum energy levels. By accurately moving the sample in two dimensions close to the NV center, we can reconstruct the magnetic field intensity map produced by the sample. This, in turn, gives access to the magnetic properties of the sample itself,” Prozorov added. 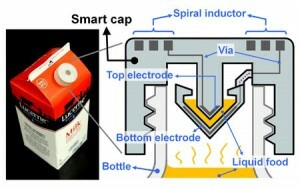 The University of California at Berkeley and National Chiao Tung University have developed a smart cap technology for milk cartons. Manufactured with a 3D printer, the technology can detect signs of milk spoilage using wireless technology. The device is basically a wireless passive sensor, which monitors the quality of liquids. With a 3D printer, researchers have devised a smart cap based on a resonant circuit. The device has a resonance frequency at 0.53 GHz. After testing the device, the results show a 4.3% resonance frequency shift from milk stored in room temperature for 36 hours, according to researchers. To make this device, researchers had to solve some challenges. Polymers are often used in 3D printing, but these materials are poor conductors of electricity. Instead, researchers used polymers and wax in a 3D printer. Then, they removed the wax. The hollow tubes were injected with silver. In the experiment, meanwhile, researchers inserted electronic components into a plastic milk carton. The smart cap included a capacitor and an inductor, which, in turn, formed a resonant circuit. Researchers are also working on this technology for health applications. This includes implantable devices with embedded transducers that can monitor blood pressure, muscle strain and drug concentrations. Singapore’s A*STAR has launched a new project that will enable printed electronics technologies for smart packaging applications. The so-called Collaborative Industry Project (CIP) within A*STAR will include the following partners: Brite Koncept, Jabil Singapore, KPP Packaging and Starlite Printers. From the CIP, participating companies will acquire knowledge in application design guidelines of printed electronics on smart packaging products. “CIP is a platform for companies with common interests to conduct R&D and develop competitive technologies. This CIP, in particular, brings together companies to develop a full spectrum of capabilities, technologies and innovative applications in the emerging printed electronics industry value chain,” said Lim Ser Yong, Executive Director of SIMTech. A*STAR’s Singapore Institute of Manufacturing Technology (SIMTech) is leading the effort.